A health worker checks a blood sample for Ebola at Kenema government hospital, Sierra Leone. The United Nations World Health Organization (WHO) has issued a roadmap that aims to stop Ebola transmissions within six to nine months, but acknowledges the actual number of cases may be much higher than that currently reported and the total caseload could exceed 20,000 over the course of the emergency. “The $490 million indicative budget for the roadmap presents a consolidated view of the estimated global resources required over the next six months – by national governments, WHO, some UN agencies and other partners – for the health response to stop Ebola transmission,” according to the 27-page document issued by the Geneva-based UN health agency. Priority is being given to needs for treatment and management centres, social mobilization, and safe burials, it said. The latest official number of Ebola virus disease (EVD) cases in Guinea, Liberia, Nigeria, and Sierra Leone stands at 3,069, with over 1,552 deaths, making this the largest Ebola outbreak ever recorded, WHO says. An unprecedented number of health care workers have also been infected and died due to this outbreak. According to the latest West African update, “the overall case fatality rate is 52 per cent. It ranges from 42 per cent in Sierra Leone to 66 per cent in Guinea.” A separate outbreak of Ebola virus disease, which is not related to the outbreak in West Africa, was laboratory-confirmed on 26 August in the Democratic Republic of Congo (DRC). In that update, WHO reiterated that it “does not recommend any travel or trade restrictions be applied except in cases where individuals have been confirmed or are suspected of being infected with EVD or where individuals have had contact with cases of EVD. The roadmap was based on comments received from a large number of partners, including health officials in the affected countries, the African Union, development banks, other UN agencies, Médecins Sans Frontières (MSF), and countries providing direct financial support, WHO said. A situation reports map is expected to begin this week containing hotspots and hot zones, present epidemiological data showing how the outbreak is evolving over time, and communicate what is known about the location of treatment facilities and laboratories, together with data needed to support other elements of the roadmap. Today’s Ebola response roadmap covers the health dimensions of the international response. These dimensions include key potential bottlenecks requiring international coordination, such as the supply of personal protective equipment, disinfectants, and body bags. The roadmap will be complemented by the development of a separate UN-wide operational platform that brings in the skills and capacities of other agencies, including assets in the areas of logistics and transportation. The UN-wide platform aims to facilitate the delivery of essential services, such as food and other provisions, water supply and sanitation, and primary health care. WHO also said today that it continues to monitor for reports of rumoured or suspected cases from countries around the world and systematic verification of these cases is ongoing. Countries are encouraged to continue engaging in active surveillance and preparedness activities, the healthy agency recommended. 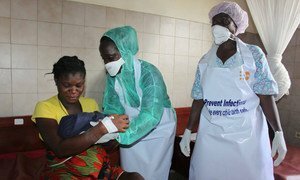 Dr. Margaret Chan, the WHO Director-General, and Dr. David Nabarro, the UN System Coordinator for Ebola who just completed a visit to the affected countries, are expected to be at UN Headquarters in New York next week, a UN spokesperson said. A three-day workshop organized by the United Nations World Health Organization (WHO) aimed at strengthening Africa’s defences against the Ebola outbreak is underway with health experts from Botswana, Ethiopia, Ghana, Kenya, Namibia, Rwanda, Tanzania, Uganda, Zambia, and Zimbabwe.